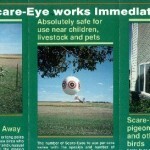 PRODUCT DESCRIPTION: Balloon which is displayed where nuisance birds are not wanted. WHERE TO USE IT: Parking lots, patios, pools, marinas, fields, parking lots and roof tops. RATE OF APPLICATION: Place one out every 100-200 feet. How soon can you mail this balloon to me. I have Crows in the walls of my apartment making a racket. They just had babies overnight. We have plenty of these in stock and ready to ship. Place your order today and it will ship tomorrow. 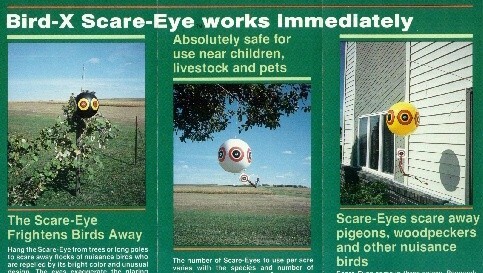 Can these balloons be used year after year at my cottage? The reason I ask is I need something that I don't have to keep buying every year. Can you send me a reply thank you. They should last many years. At least thats what they were built to do. So if they don't receive any kind of "abuse", you should expect to get several useful years of service from them.